During the first round of the 2013 NHL draft, The New York Islanders sent the 2010 5th overall pick, Nino Niederreiter, to the Minnesota Wild, in exchange for forward Cal Clutterbuck and a 2013 3rd round pick (70th overall). The Islanders would turn that pick around to obtain Waterloo forward Taylor Cammarata. In 64 career NHL games with the Islanders (55 during the 11-12 season), Niederreiter had 2 goals and 1 assist to go along with his -30. Clutterbuck, a RFA who will turn 26 in November, has a total of 110 points (62 G, 48 A) in 346 career games. This is a trade that seemed inevitable, but also could be one that ends up being regrettable. After not being invited to training camp this past season, a rift seemed to occur between Nino and the organization. Niederreiter quickly fell out of favor with management and was passed on the depth chart by prospects such as Anders Lee and Brock Nelson. Garth Snow dangled the Swiss native around the trade market, but fellow GM’s recognized they had the upper hand in the situation. After not being able to centerpiece a deal around Niederreiter for LA’s Jonathan Bernier, Snow was left to essentially cut his losses. The Isles part ways with a top-5 pick who has scored at every level he has played with the exception of the NHL. And this is easily justified by the way Nino was used with his time on the big club. Niederreiter received bottom 6 minutes and it’s tough to assess his NHL experience because of this. Based on these factors, it’s not out of line to foresee 20-30 goals from Niederreiter in the next 2-3 years. In return, the Islanders get back a true bottom-6 forward who will help round out the 4th or possible 3rd line. Clutterbuck has showed some offensive ability in the past when given the opportunity but is much more known for his physicality. With his addition, the Islanders will have the league hits leader from the last 5 seasons (Clutterbuck and Matt Martin). In fact, Clutterbuck could be seen as a right handed Matt Martin with a bit more offensive upside. Those two around Casey Cizikas could make up a promising 4th line to start the season. Surprisingly, the piece that excites me the most from this deal is drafting Taylor Cammarata. Cammarata was last year’s USHL player of the year. The Minnesota native led the USHL in goals and points last year, with 38 and 93 respectively. The undersized forward (5’7”, 156lbs) could just become another draft day flop, but maybe he becomes the Isle’s Martin St. Louis. The “Rick DiPietro Era” has officially ended on Long Island. 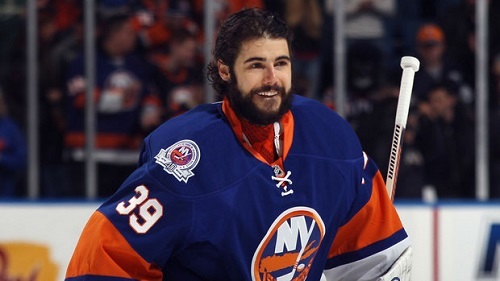 On Tuesday, July 2nd, the New York Islanders put former franchise goaltender Rick DiPietro on unconditional waivers. Following this, the team will execute one of their compliance buyouts to end their relationship with the American goalie. DiPietro will receive 1.5 million annually for the next 16 years. His initial contract from 2006 was for 15 years at 67.5 million. The 1.5 million will not count towards the Isles’ cap, and DiPietro will be free to find work elsewhere. There are so many emotions Islander fans associate with Rick DiPietro. It’s tough to not express some sort of bitterness towards the Massachusetts born goalie, but at the time the franchise signed him to the now laughable contract, Rick was a bon a fide all star in net who started for his country at the 2006 Olympics. The monstrous contract should be negatively associated with the franchise and not DiPietro. All in all, Rick has always been a competitive athlete who simply wanted to win. His string of bad luck injuries shouldn’t be held against him. As the Islanders continue to try to shed its “laughing stock” image, hopefully cutting ties with DP will be one of the final pieces to help re-legitimize the Long Island organization. Will these two transactions simply be the appetizer? Will this lead to a major goaltending acquisition? I really hope the answers are yes, but the team’s frugal history has me worried. You can file the Niederreiter trade in the “wait and see” file. The Islanders gave up a lot of scoring potential just to add to their already overcrowded “bottom 6” stable. The team still needs a legitimate top-line wing to play along John Tavares. Let’s see if there’s any truth to the Danny Briere rumblings. The Islanders also need to sign a goalie. There has been no progress with Evgeni Nabokov and he will reportedly test free agency. The buyout of Rick DiPietro has no bearing on the team’s cap status given they are currently 12.5 million below the cap floor. What it does do is give the team an extra 3 million a year to play with. There is no reason why this money should not be invested back into the current NHL lineup. With the free agency pool looking a bit thin, will Garth Snow make a splashy trade? Halak, Hiller, Miller? This should be answered by July 5th. At this rate, it will be completely disappointing if GM Garth Snow does not make a significant roster upgrade up front or in the net.